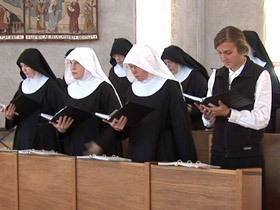 LUCKY SEVERSON, correspondent: Near the Colorado-Wyoming border, beneath the snow covered Mummy Mountains, amongst the grassy meadows, the soothing sounds of psalms being sung by Benedictine nuns, praying for themselves and for the world. Altogether they pray over three-and-a-half hours a day. And then in between prayers, rushing out to the corral to rein in the cattle, and the cattle don’t always cooperate. This is the Abbey of St. Walburga. 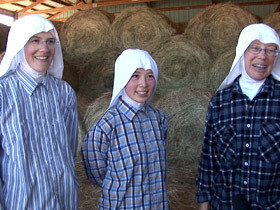 It’s a working ranch, and the nuns are the ranch hands when they’re not praying. And they pray together seven times a day, always in their habits. (speaking to Abbess): You change your clothes a lot, don’t you? MOTHER MARIA MICHAEL: We do. SEVERSON: Seven times a day? MOTHER MARIA MICHAEL: Seven time a day, uh huh. SEVERSON: This is Mother Maria Michael. She’s the abbess of the Abbey, the Mother Superior to 23 nuns. She says this is not a lifestyle for everyone. MOTHER MARIA MICHAEL: It’s a very hidden life. It’s not out for the world to see, and so you have to be pretty willing to be hidden and to believe that your life will make a difference even though you may not be out in the front. 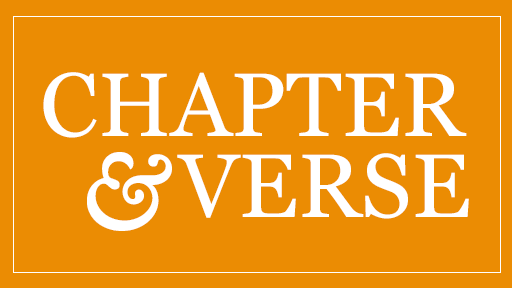 SEVERSON: It’s a very cloistered life. The sisters rarely leave the ranch. This place may be hidden, but it’s not forgotten. The Abbey retreat is a popular respite. Wayne and Kathy Meyer come here as volunteers even though they are not Catholics. KATHY MEYER: I think once you get off of [US Highway] 287, and you come down the dirt road and see the meadow, and you see the snow-capped mountains in the background, it’s just a real calming effect. SEVERSON: Wayne Meyer’s brother was seriously injured in a car accident. He asked Mother Maria Michael to pray for him, and the Meyers believe that’s the reason his brother survived. MOTHER MARIA MICHAEL: You really feel you’re praying for the world. You really take to heart when people write to us and ask us to pray for them. We take it to heart, their sufferings, and we bring them in prayer, and we ask God to sincerely help them. SEVERSON: Some come here for the grass-fed organic beef, raised gently and so sought after people get on a list to purchase it. The sisters love cows, especially the nun in charge of the ranch: Sister Maria Walburga, who has been with the abbey for 25 years. The cattle know when Sister Walburga is driving the tractor that hay is on the way. SISTER MARIA WALBURGA: But the cows, too, keep you rooted. They’re beautiful in their own way. We love cows—everyone who works here. But they’re, also—they are humble animals, and they teach us a lot of patience. SEVERSON: The patience is easy to understand, because the cows don’t act very humble. The nuns here range in age from 23 to 93. Sister Ann Lee is the youngest. She’s been here almost two years. SISTER ANN LEE: I loved farms and animals and, you know, just nature, but I didn’t really associate that with being a nun until I came here. SEVERSON: For Sister Ann, the abbey ended up at the end of a search for a life with purpose. SISTER ANN LEE: Well, you know, I’d like to be a spy. I was a firefighter and EMT. There was just so much I wanted to do. You have to decide. I can’t do it all. I’d be a jack of all trades and master of none, so I want to choose the highest one that I can do. SEVERSON: If the smile on her face means anything, Sister Ann has found her calling. All the nuns here say they have been called by God. MOTHER MARIA MICHAEL: You couldn’t do it without the call, because it is a hard life. But it’s a glorious life. SEVERSON: Many Catholic communities and orders no longer wear traditional black-and-white habits, but they are the uniform here, and Sister Magdalene Berndlmaier from the Bronx, who runs the gift shop, wouldn’t have it any other way. SISTER MAGDALENE BERNDLMAIER: People are hungry for the traditions of the Church that has women in habits that they can see. There are many wonderful religious sisters who are out doing all kinds of wonderful work, but because they’re dressed like everybody else people don’t see them. MOTHER MARIA MICHAEL: We’re all human. There’s temptations all the way around. But when you’re wearing the habit you understand your actions mean more and that you are responsible for something greater. SISTER MARIA GERTRUDE: I hope no one would ever associate us with being ruler wielding nuns with you know our disciplinarian beating stick. 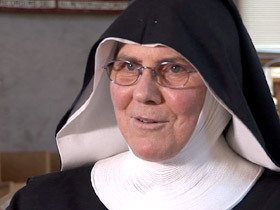 SEVERSON: Sister Maria Gertrude. She’s been here ten years. 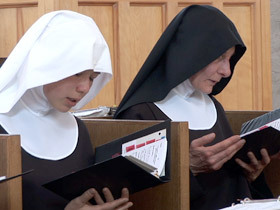 SISTER MARIA GERTRUDE: Here we make it our mission to praise God all day long, all night long, with our entire lives, and to also be a place where others can come and find God. SEVERSON: St. Benedict left the decadence of Rome around 500 A.D. to lead an austere life. The nuns of the Abbey of St. Walburga fled Germany and the Nazis in 1935 and ended up in Colorado and eventually here in a town that no longer exists called Virginia Dale. The Benedictines’ closeness to nature and their manner of prayer dates back hundreds of years. (speaking to Sister Magdalene Berndlmaier): You get lots of requests from people? SISTER MAGDALENE BERNDLMAIER: We get so many requests. People call us on the phone with lists of things to pray for. I mean people are suffering in so many ways. It’s very edifying to me to know how they depend on our prayers. I mean really they have great faith in us that makes us very humble. SEVERSON: The ranch covers almost 300 acres, all donated, and includes some animals you wouldn’t expect. SEVERSON: So they milk the water buffalo and make wonderful mozzarella cheese. And now they’ve got a baby water buffalo named Yoda. SEVERSON: They also raise bees. That’s Sister Gertrude job, and apparently she’s doing it right. Martin Hardison is a master bee keeper who worked all over the world to save the declining bee population. MARTIN HARDISON: Here they’re thriving. They’re doing great. This environment, of course, is completely pristine, you know, and that’s a real advantage, you know. They don’t use pesticides out in the field. SEVERSON: And then, of course, there’s the llama, the watch dog—something that’s needed around here. Bears have found the bees and their honey, and the mountain lions are fond of calves. SISTER MARIA GERTRUDE: The cattle were grazing in the hay pasture, and we saw with our own eyes a llama chase a mountain lion out of the field. SEVERSON: The nuns rise before sun-up, pray, tend to chores, and do it all over again the next day. And they feel they’re experiencing heaven on earth. MOTHER MARIA MICHAEL: You have in the midst here a silence that just breathes in you the greatness of God. You just, you—there’s an immensity you can only grasp in the middle of something so grand. For Religion & Ethics NewsWeekly, I’m Lucky Severson in Virginia Dale, Colorado. We take you to Virginia Dale, Colorado, where a community of Benedictine nuns live a life of prayer and work on a 300-acre cattle ranch. At the Abbey of St. Walburga, situated among grassy meadows and snow-capped mountains, the sisters sing the psalms, pray, and raise cows for the grass-fed organic beef they produce. “Here we make it our mission to praise God all day long, all night long, with our entire lives, and to also be a place where others can come and find God,” says Sister Maria Gertrude, the abbey’s bee keeper.